With a population of 464,678 inhabitants as of the 2001 census, it is Argentina's 8th largest city. It is situated in the Lerma Valley, 1,152 meters above sea level, at the foothills of the Andes mountains. Nicknamed Salta la Linda ("Salta the Pretty"), it has become a major tourist destination due to its old, colonial architecture and the natural scenery of the valleys westward. 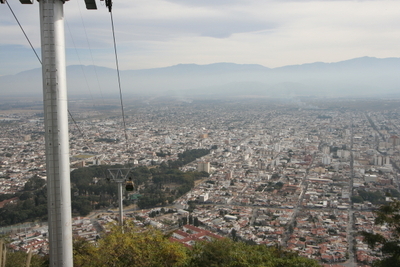 Salta la Linda ("Salta the Beautiful") is a city with the best preserved colonial architecture in Argentina. San Bernardo es el nombre de un cerro situado en el noroeste de Argentina, en la Provincia de Salta. Su cima se eleva a 1.454 metros de altura sobre el nivel del mar. Al pie del cerro, a 1.187 msnm, se encuentra la ciudad de Salta, capital de la provincia. Visto desde la ciudad, el cerro parece tener una altitud de 264 metros. Basílica Menor y Convento de San Francisco de la Ciudad de Salta, Argentina. Iglesia y Convento de la Orden Franciscana, en Salta, Capital. Patron saint of the pets in Salta. “Plaza 9 de Julio” (9th of July Square). In this place Hernando de Lerma founded the City of Salta in 1582. The houses that surrounded the square are characterized by their porches. Tasty food, a rich musical tradition and powerful wines, the place should not be missed!! Text is available under the terms of the GNU Free Documentation License, because some texts are taken from Wikipedia. Photos and images are explicitly not available under the terms of the GNU-License. In case you want to use them, read and follow our terms of copyright and licensing.